When you meet the owners of Newport Beach’s famed beach hangout Mutt Lynch’s, you immediately know you’re not only dealing with local history, you’re dealing with family history. The 40-year old, family-owned dockside restaurant/bar is named after the owner’s grandfather, a WWII veteran, and is one of those places that the locals would like to keep a closely guarded secret. 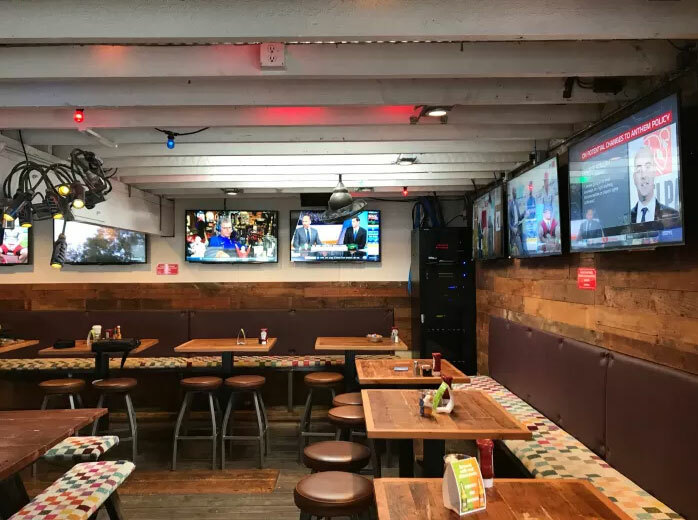 While patrons appreciated the bar’s rustic vibe, Mutt’s AV system had become extremely outdated. All the speakers had blown, staffers could not easily control the space’s AV, and there was no protection against the frequent power spikes and surges the venue was experiencing. Rick Geller, owner of local integration firm Vector Media Solutions, was initially hired to simply replace the venue’s failing speaker system. However, what this popular old beach hangout needed was a complete renovation, one that would do the Lynch family proud. And Geller says he knew Elan would be the “perfect automation system” to keep Mutt Lynch’s vibe rolling for generations to come. The sound system at Mutt Lynch’s needed a total overhaul, but the systems needed to be consistent with the popular Newport Beach’s bar vibe. Once approved, Geller installed three Elan gSC10 controllers and an Elan 1616A amplifier to immediately address the staff’s need for hassle-free control. 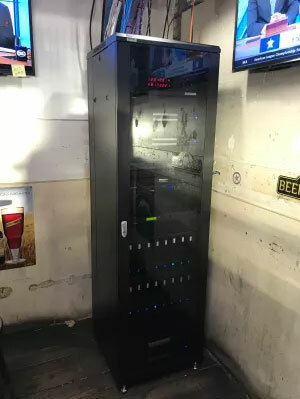 He also added an Elan HR200 remote to help them change channels on 33 televisions, and an Elan KP7 wall-mounted keypad to control the venue’s AV with ease. To replace Mutt’s sound system, Geller brought in 13 SpeakerCraft outdoor speakers that immediately took the venue’s music experience to new heights and handled the rough elements inherent with a bar on the beach. After opening in 1976, Mutt’s had to move in 1982 after a fire destroyed its original Balboa Peninsula location. The 100-year old brick building at its current Newport Beach location presented Geller with a few interesting challenges, not the least of which was its unique rafter ceilings—the staff at Mutt’s made it clear that it was important that this installation be done without changing the venue’s rustic-beach feel the place was known for. Keeping the rustic vibe at Mutt Lynch’s meant exposing typically hidden AV components like this OmniMount RE42 AV Rack System Cabinet. Geller was even able to customize the ELAN controller with a button on the app called “Game Day” that is used during the football season; this allows staff to instantly switch the AV system to the various NFL football games taking place on Sunday afternoons. With power brown-outs pretty common for beachfront establishment, Geller relied on Panamax surge protectors, and more specifically, the company’s BlueBOLT technology that resides within—a real-time, cloud-based control and monitoring system to handle power spiking and surging issues. Geller added that due to the remote backup, monitoring, and surge protection capability, BlueBOLT has virtually eliminated service calls for him. All of this was the kind of insight Lynch was looking for when he initially hired Geller for the quick speaker swap out, and the reason why this project ultimately turned into so much more. The downside to the install? There’s just one according to Lynch: the local secret of Mutt Lynch’s may not be such a well-kept secret after all.